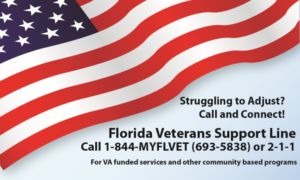 The Florida Veterans Support Line is now online and available statewide. This VA funded project provides assistance to Veterans and guidance as to community based programs. Veterans that need help adjusting or transitioning to civilian life can obtain help and direction from a fellow Veteran. Prominent services include crisis and suicide prevention, substance abuse help, mental health, disability assistance, health care, and emotional support. Call 1-844-MYFLVET (693-5838) OR 2-1-1. Next Article Happy Birthday Rock Merritt!